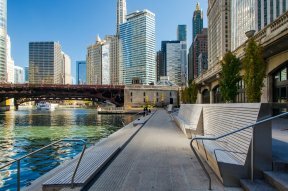 The Chicago Riverwalk was selected as one of thirteen global winners of the Urban Land Institute’s (ULI) 2017-2018 Global Awards for Excellence. The award honors the Riverwalk for its merits and economic development impact in the City of Chicago. This is the 19th major award for the Riverwalk. The ULI Global Awards for Excellence recognize real estate projects that achieve the highest standard of excellence in the design, construction, economics, planning and management. The Global Awards for Excellence are considered one of the land use industry’s most prestigious awards programs. The six-block section of the Riverwalk was designed by a team of architects including Sasaki and Ross Barney Architects and is managed by the Department of Fleet and Facility Management. Construction of the newest sections was completed in October of 2016 and led by the Chicago Department of Transportation (CDOT), with construction management provided by Alfred Benesch & Co. Engineers and Walsh Construction as the general contractor. 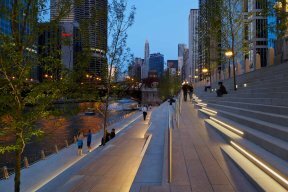 For more information on the Chicago Riverwalk, please visit www.chicagoriverwalk.us.